The photograph discussed in this blog post captures a dramatic moment during an attempted deportation of a group of Jews who escaped after the occupation of the Protectorate Bohemia and Moravia. The series of photographs captured on March 30, 1939 at the Croydon airport close to London has attained an almost iconic character; their visual power demonstrates the restrictive approach of Great Britain to Jewish refugees from Nazi occupied Europe. For instance, the photo was used to this effect in the opening section of a recent Wiener Library exhibition. However, the refugee carried by force to the airplane remained unknown and nameless, as do most photographed refugees to this day. Thanks to a documentation project on the Jews in Ostrava (described below), the identity of the person could be ascertained and the background of these dramatic events much better described. Moreover, it provides a possibility to look critically at how photographic evidence of refugees and of the Holocaust more generally is used. Although this blog post is just a snapshot of ongoing and unfinished research, the events at Croydon airport can be reconstructed from the press and newly uncovered family archives. Who is on the photograph? Not much is known about the group of mostly Jewish refugees who stepped out of the airplane on the tarmac of the Croydon airport on the Wednesday evening, March 29, 1939, and who were refused entry into the United Kingdom. It appears that most of them came from the region of Moravská Ostrava/Mährisch Ostrau in former Czechoslovakia, a centre of the coal and steel industry and a vibrant Jewish community before the war. Given the proximity to the Polish border, many Jews from the region managed to flee in the early period of the Nazi occupation. It can be deduced that pre-occupation contacts and networks made it possible for them to connect after escaping to Poland. The identity of the refugee carried by officials at Croydon was documented by the Ostrava project at the Kingston & Surbiton District Synagogue led by David Lawson. Interest in this far-away and more or less unknown Jewish community in today’s Czech Republic, even if very important before the war, was sparked by a Torah scroll originating from Ostrava which the synagogue has on loan. These scrolls were, along with a large number of other Judaica, confiscated during the occupation and sent to the Prague Central Jewish Museum for safekeeping. After the war, the Communist state, hungry for foreign currency, sold the Torah scrolls to a group of English Jews who aimed to save these objects from destruction and to bring them back to life by distributing them into Jewish communities around the Western world. The Ostrava project was lucky to find a number of former Jewish Ostravaks, many of them living in the UK. Recording their stories and collecting family documents, they not only created a unique archive, but also a world-wide community of families related to Ostrava. Among the witnesses of Jewish life in pre-war Ostrava was Norbert Goldberg. Bertie (as he was known) shared his large and unique archive of family letters and other documents. Those also included newspaper cuttings with the photo above and letters identifying the man captured there as his older brother Oskar. Oskar Goldberg was born in 1911 into a Jewish family from Galicia which fled into the interior of the Habsburg monarchy before the advancing Russian army during WWI. In fear of destruction and anti-Jewish violence they made their way to the industrial city of Ostrava where Oskar’s father David would (after having served in the Habsburg army) found a successful textile production and business. Albeit stateless, the family prospered in interwar Czechoslovak nation state and its business expanded. When the German army marched into Ostrava, on March 14, 1939, Oskar was on a business trip to Poland. Having been warned by his family not to return, he helped to organise the group of refugees and together to charter a plane to the United Kingdom. The family tradition has him, perhaps correctly, as the core organiser and the soul of the whole group. The group coming from Warsaw, including Oskar Goldberg, was among those turned back. From the available information it seems that only one of them, David (Deszo) Herbst, was allowed to enter the country. Herbst was a prominent textile manufacturer and his wife (a former Austrian tennis star) and daughter were already waiting for him, as were friends testifying to his financial capacity. Herbst was said to have been in hiding for two weeks after the occupation and to have escaped illegally over the Protectorate-Polish border, having crawled 18 miles in the snow.3 The remaining twelve refugees were detained and brought to police stations in Croydon and Wallington and supposed to be returned the next day to Copenhagen. Why then was this group refused entry? Following the occupation of the rest of the Bohemian Lands (March 14-15, 1939), the British Home Office introduced obligatory visa requirement for the citizens of the Nazi-dominated Protectorate Bohemia and Moravia. Therefore, the refugees apparently hurried to arrive just before the restriction coming into effect on April 1, 1939. It seems, though, that the decision to deport them was taken because they weren’t deemed regular visitors (who could enter free of visa), but rather as refugees who would require a guarantees for entry. The exact reasons for the refusal are reserved for future research. 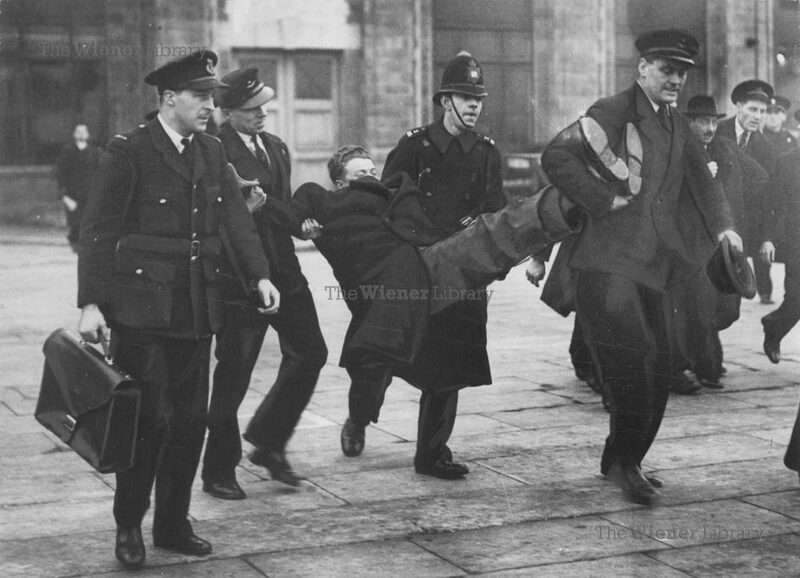 Taken by the Daily Mail photographer Weston, the photograph of Oskar Goldberg was one of a series of photographs showing refugees at Croydon being escorted back to the airplane, or in shock upon learning that they eventually would be allowed to stay. Yet, it proved to be more than just documentary material. The photographs themselves became part and parcel of the story of the refugees they depict. The photograph provides insights into and invites to critically consider the visual representation of refugees and refugeedom. Refugeedom is – of course – often difficult to capture visually, through the media of photography. Refugees can be mostly photographed in “banal”, daily-life, situations that need knowledge or further explanation to recognise and understand. That’s why images like this one, visualising refusal which – in most cases – resists being caught by the lens of a camera, attain such a significance. The rest of the Goldberg family received no media attention. Once in London, Oskar stayed in the Jewish Temporary Shelter in the East End and feverishly tried to arrange immigration of his family. Immediately after the occupation of Ostrava, Oskar’s father was warned to leave and together with his other two sons, Max and Norbert, illegally crossed the border of the now occupied Protectorate Bohemia and Moravia to Poland, using the services of a people smuggler. Whereas David joined his family in Oświęcim, the brothers strove to follow Oskar to Britain. As the chance of obtaining regular visa was bleak, they were only able to receive transit visa, based on the steam tickets from the United Kingdom to Shanghai bought by Oskar. In this way, the brothers were re-united in England before the outbreak of the war. As if replicating the pre-WWII success of their father, they established a successful textile business in the United Kingdom. The family letters between the Protectorate and the United Kingdom show the desperate attempts to bring the rest of the family out. Yet, the outbreak of the war and the tightening of the visa obligations made it impossible. Oskar’s father living now in Oświęcim, his mother and sisters with their families in the Protectorate were all deported and killed during the Holocaust. The fate of the Goldberg family is documented and their archives made accessible through the online exhibition and in the online catalogue of the Jewish Museum in Prague. The author would like to express his gratitude to colleagues who have contributed to various aspects of this article: Felice Hardy, David Lawson, Louise London, Magda Veselská, Barbara Warnock. All mistakes are – of course – mine.